Dismissed casual workers of Kaduna Electricity Distribution Company, on Tuesday blocked the entrance gate of the company in protest of their three month outstanding salaries and unlawful disengagement. But presence of heavy security men prevented them from gaining access into the company’s main yards. 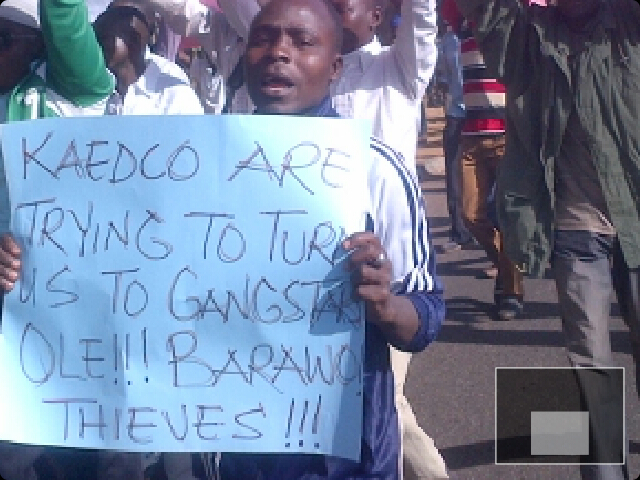 Protesting staff, who carried placards with inscriptions such as: “Baba Buhari please reverse sale of PHCN now, KAEDCO casual calling on FG. to intervene over unpaid entitlements, You,ve failed your part of the deal ,pay us KAEDCO” also called on President Muhammadu Buhari to reverse the sale of PHCN . Leader of the casual staff, Ahmed Mohammed said the management of Kaduna Electric Company must pay all the salaries owed them without any delay. He said he can’t understand why the management that have agreed to pay the three months owed suddenly refused on grounds that the casual staff were never engaged by KAEDCO. He however, said since it appeared that the management of KAEDCO cannot cope with pressure and demand to deliver on its promises made before taking over PHCN , the sale of the company should reversed. To back up their demand reverse of PHCN sale , he said , “We have a copy of the court order stopping the sale of PHCN and reversing to status quo , so we urge Federal government to enforce the order ” Mohammed stated. there is nothing such as casual staff union as so the protest is illegal. Abdullahi, who later admitted that the protesting casual were never engaged by KAEDCO, said they were staff of defunct PHCN. However, he explained that out of compassion, when they killed pressure on the KAEDCO management to pay them, 396 staff were paid. He also revealed that still out of compassion, the new management equally employed two hundred of the casual staff. On the issue of court order, he said as far as KAEDCO management is concerned, BPE knew about the court order before PHCN was sold , so it is not a problem that should worry the new management.